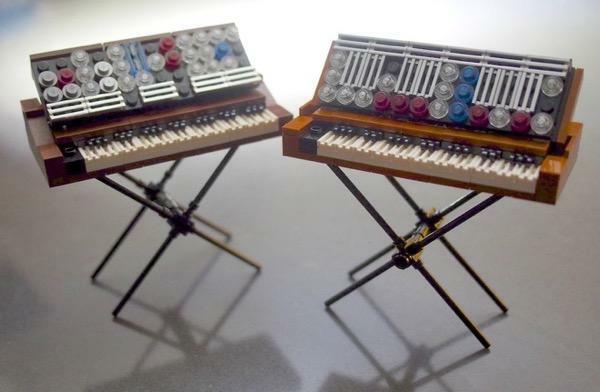 Andy G made these little Minimoog Synthesizers out of Lego bricks, If 10,000 people approve his proposal on Lego Ideas, Lego might create a kit and sell them. Go retro-analog with these miniaturized versions of the classic Minimoog synthesizer! The Model D (left) and the Voyager Old School (right) are both represented in a small display set that would look great on the shelf of any synth geek, electronics buff, or general music lover. In 1970, Bob Moog's company revolutionized the synthesizer industry once again by incorporating elements of his monumental Moog Modular in an all-in-one portable package, enabling electronic musicians to easily bring these spectacular sounds onstage. The iconic Model D and its subsequent revisions defined the sound of bass and lead sounds in pop and rock music for decades. In 2002, along with the resurgence of retro synthesis, Moog repackaged the Minimoog into a new model, the Voyager. The Voyager "Old School" is the model depicted here. The control panels are not intended to be a one-to-one reproduction of the control panels of these instruments, which would be practically impossible at this scale. Instead, I chose to simply suggest the knobs and switches and panel prints with simple elements. The design of the side panels closely resembles that of the original models: metallic on the Model D and wood-grain on the Voyager Old School. Both synths sit on simple Lego recreations of an X-style keyboard stand. Another detail of note is the accurate representation of the keyboard. Many piano and organ builds do not accurately reflect the pattern of black keys in alternating groupings of 2 and 3, but I found a way to achieve this with a combination of a could hinge elements oriented in different directions. These all reside atop white grille tiles, but utilizing hidden jumper tiles to achieve the most correct proportion possible. Possible project updates include additional Minimoog models and refinements. Models of synths or keyboards from other manufacturers will likely merit their own projects. Synth lovers unite, and help make these recreations a reality! They look great on my desk, and they'd certainly look great on yours!